The Surface Force consists of the Surface Combatant Force, the Amphibious Warfare Force, and the Afloat Support Force. In their war-fighting role, surface combatants are expected to counter a wide variety of threats across all domains. They must be capable of conducting constabulary tasks such as dealing with piracy, illegal fishing, bio-diversity (quarantine) infringements, human trafficking, drug and arms smuggling and illegal maritime arrivals. Furthermore, they must be able to participate in an equally broad range of diplomatic operations either independently, or as part of a larger task force. The Surface Combatant Force currently consists of one recently commissioned Hobart class DDG, three Adelaide class FFGs and eight Anzac class FFHs. Significant upgrades have been made to both classes of frigate in order to maintain their effectiveness in a multi-threat situation. 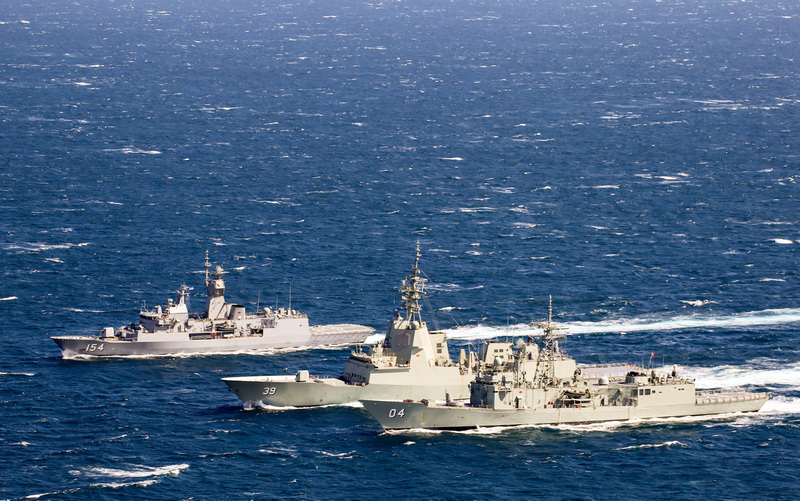 HMAS Parramatta (FFH154), NUSHIP Hobart (DDG39) and HMAS Darwin (FFG04) sail together. Amphibious forces, by their nature, possess mobility in mass, but their defining characteristic is their unique cross-domain mobility and they are useful across the full spectrum of military, constabulary and diplomatic tasks. In periods of tension putting a maritime force to sea can be prudent, providing a gesture of support to allies or a threat to adversaries. The capacity to provide a sustained forward presence is a powerful diplomatic tool, while its ability to manoeuvre freely at sea can be used to escalate or defuse tensions as required. 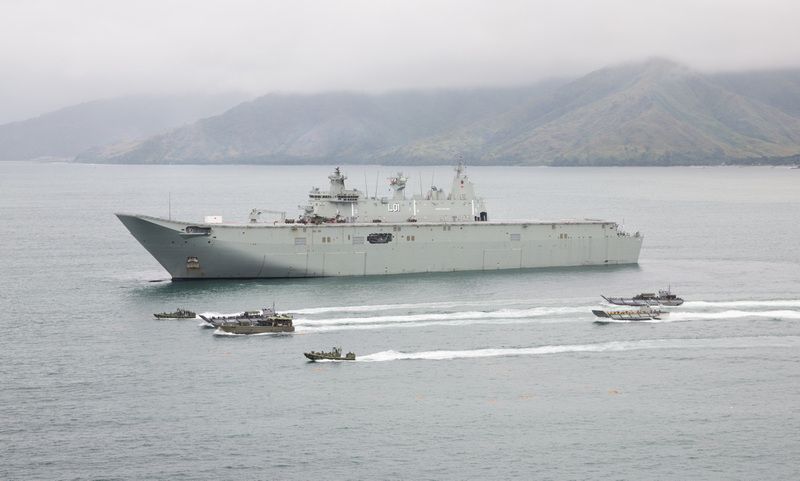 The Amphibious Warfare Force currently consists of two Canberra class LHDs, one modified Bay class LSD and a number of types of landing craft such as LLC, LCVP and the Australian Army's LCM-8. Landing craft from the RAN and Australian Army in formation with Philippine Marine Corps small unit riverine craft, during humanitarian assistance and disaster relief training conducted from HMAS Adelaide in Subic Bay, Philippines. The primary operational contribution of the Afloat Support Force is the delivery of logistic support to surface combatants and other ships while they conduct combat operations at and from the sea. The effectiveness of warships is enhanced by providing logistic resupply in the area of operations, allowing surface combatants and amphibious forces to prolong operations, or extend their range and endurance. The Afloat Support Force currently consists of one modified Durance class AORs and one modified commercial tanker AO. 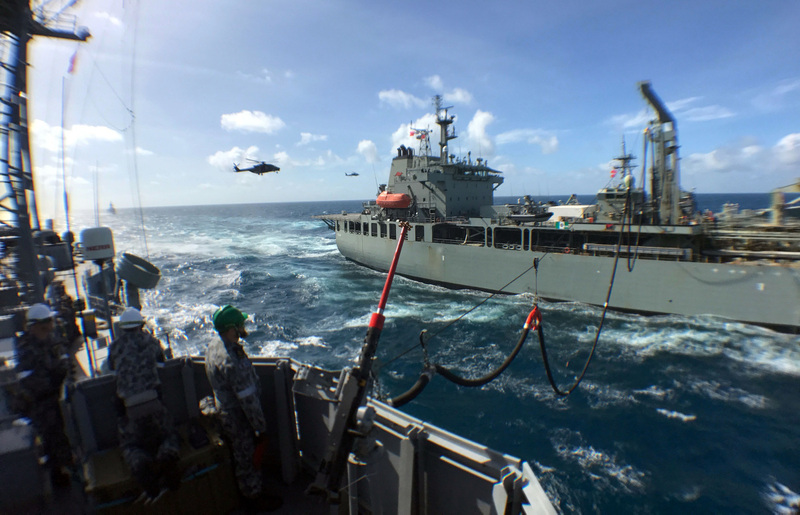 HMAS Sirius conducts a dual replenishment at sea with HMA Ships Melbourne and Darwin.